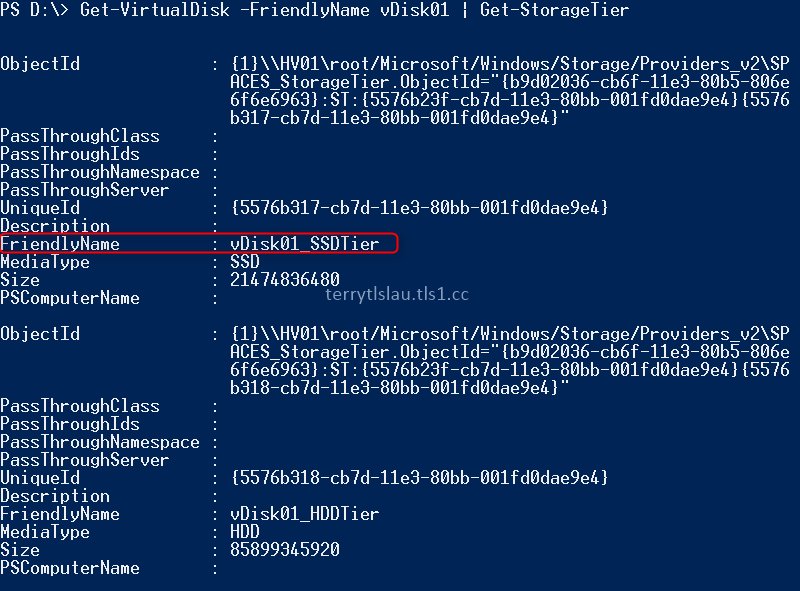 Administrators can configure Storage Tiers by GUI in Windows Server 2012 R2. However, administrators cannot configure the write-back cache size through GUI. Plus, administrators may want to test it in a test environment. 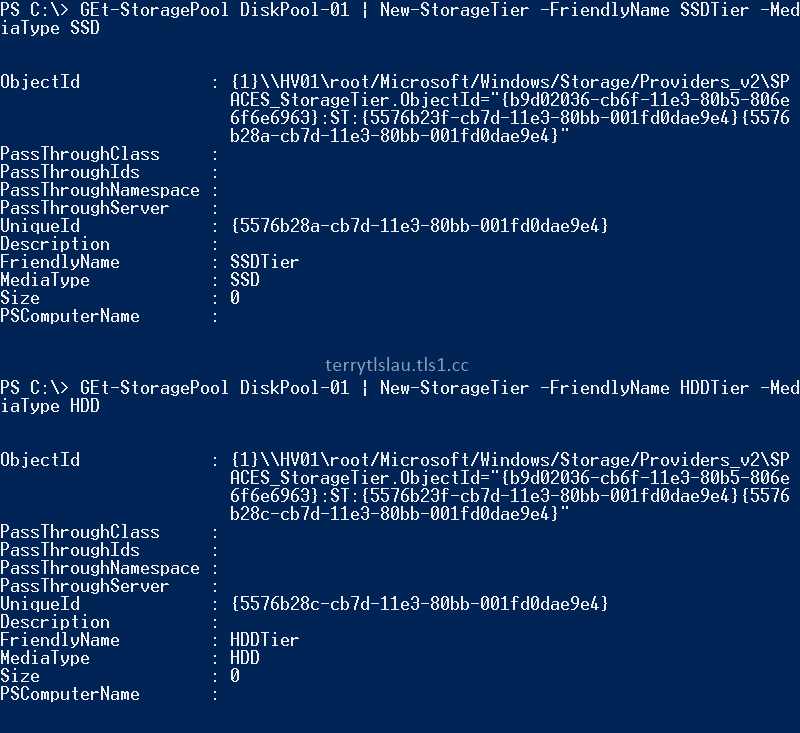 For some reasons, administrators should perform PowerShell to configure Storage Tiers. 3. Perform "Get-PhysicalDisk -CanPool $True" to check the disks which can be added to a storage pool. 4. Perform "New-StoragePool -FriendlyName DiskPool-01 -StorageSubSystemFriendlyName (Get-StorageSubSystem).FriendlyName -PhysicalDisks (Get-PhysicalDisk -CanPool $True)" to create a new storage pool named DiskPool-01. 5. Perform "Get-StoragePool DiskPool-01 | Get-PhysicalDisk | Select FriendlyName,MediaType" to verify the media type of disks. 6. Perform "Get-StoragePool DiskPool-01 | New-StorageTier -FriendlyName SSDTier -MediaType SSD" to create SSD Tier for "DiskPool-01" storage pool. 7. Perform "Get-StoragePool DiskPool-01 | New-StorageTier -FriendlyName HDDTier -MediaType HDD". To check the storage tier supported size for "Simple" or "Mirror" types, administrators can perform "Get-StorageTierSupportSize -FinedlyName *SSD* -ResiliencySettingName <Type>". 8. Perform "$SSD = Get-StorageTier -FriendlyName SSDTier" to store the SSD tier to a variable. 9. Perform "$HDD = Get-StorageTier -FriendlyName HDDTier" to store the HDD tier to a variable. 10. Perform "Get-StoragePool DiskPool-01 | New-VirtualDisk -FriendlyName vDisk01 -ResiliencySettingName Simple -StorageTiers $SSD, $HDD -StorageTierSizes 20GB, 80GB -WriteCacheSize 5GB" to create a new virtual disk which is named vDisk01 and then the size of vDisk01 is 100GB. We also assign 5GB write-back cache for this virtual disk. Remark: "Write-back cache" option only can by applied by PowerShell. 11. Perform "Initialize-Disk -VirtualDisk (Get-VirtualDisk -FriendlyName vDisk01) -PartitionStyle GPT" to initialize the virtual hard disk. 12. Perform "New-Partition -DiskNumber 8 -UseMaximumSize -DriveLetter D" to create a new partition. 13. Perform "Format-Volume -DriveLetter D -FileSystem NTFS -Confirm:$false". Using PowerShell, administrators can assign files to SSD tier by performing the following cmdlets. 1. Perform "Get-VirtualDisk -FriendlyName vDisk01 | Get-StorageTier" to check the existing Storage Tier name of the virtual hard disk. 2. Perform "Set-FileStorageTier -FilePath <File Path> -DesiredStorageTierFriendlyName vDisk01_SSDTier" to assign the file to SSD Tier. 3. Perform "Get-FileStorageTier -VolumeDriveLetter <Drive letter name>" to verify the file in which tier. You can also follow the article, Why R2? 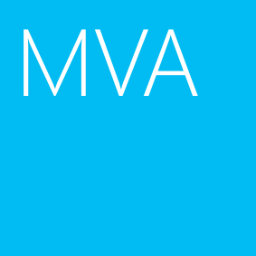 Step-by-Step: Automated Tiered Storage with Windows Server Server 2012 R2, which was written by Keith Mayer to test Storage Tiers in a virtual machine environment. 4. Perform "New-StoragePool -FriendlyName DiskPool-01 -StorageSubSystemFriendlyName (Get-StorageSybSystem).FriendlyName -PhysicalDisks (Get-PhysicalDisk -CanPool $True)" to create a new storage pool named DiskPool-01. Thanks for your comment. Step 4 was updated.